It was easy to fall in love with the idea of honeymooning in southern Italy. 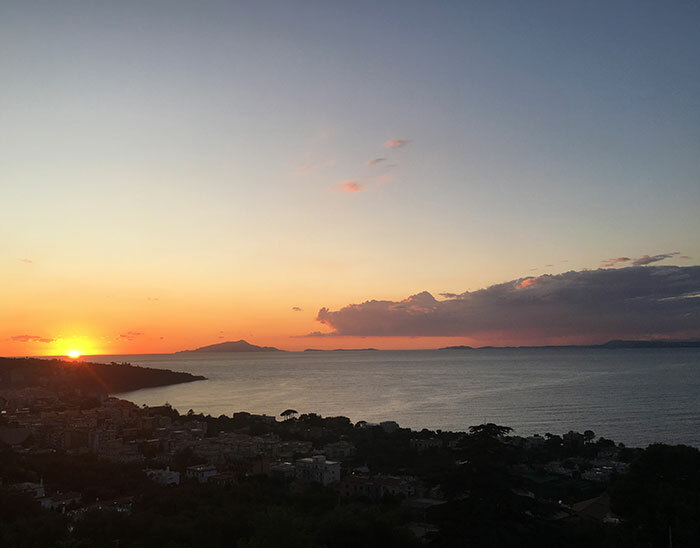 We chose Sorrento as not only did it work out cost effective, but it was also an ideal jumping off point for exploring the region’s other postcard-perfect highlights. The town of Sorrento was a pleasure to explore; we wandered through all the cobblestone streets in the Baroque centre and felt like we’d been transported back in time. We dipped in and out of shops, art exhibitions and awe-inspiring churches, filled with the most ornate, gold-covered statues and phenomenal paintings. We then had lunch at Inn Bufalito Taverna Mediterranea in Vico Primo Fuoro: paccheri with buffalo meat ragu and gemelli pasta with tomato, basil, mozzarella. The food was tasty and the service was great; we really didn’t want to leave, and we could tell that was a common opinion; the restaurant even has board games you can play if you want to while away an afternoon or evening here. We finished our lunch with some mouth-watering gelato from nearby Fresco Sorrento Gelateria, where I struggled to pick just three scoops from the array of flavours on offer! 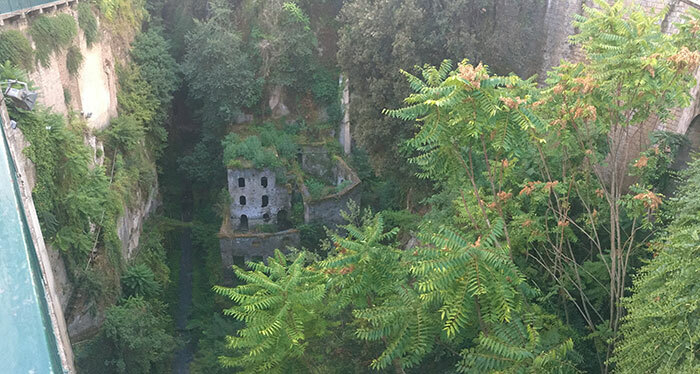 A hidden gem I would highly recommend visiting is Vallone dei Mulini (Valley of the Mills). It’s all too easy to miss it, but just off Piazza Tasso turn down the Viale Enrico Caruso, with the Fauno Bar on the corner, and 200m later take a peek over the bridge to your right. The mills in the deep gorge here were closed in the 1940s and haven’t been touched since, leaving the area to be reclaimed by nature. Lush greenery carpets the buildings, give it an almost ethereal feel, where enchanting natural beauty meets with a seemingly post-apocalyptic world. With my now husband being a bit of a history buff, a trip to the Roman town of Pompeii was a must. I’d recommend picking up tickets for a walking tour from the tourist office at Sorrento station, and then get the train to Pompeii Scavi station to meet your guide. Pompeii is so huge it would be easy to get lost on your own, plus the guides really know their stuff. Ours taught us so much about the town’s ill-fated history, as well as showing us some ancient political graffiti. Plan your trip early in the morning to avoid the midday sun if you can, and definitely wear a hat and plenty of suncream too, as there’s very little shade there. Also, there are vendors selling ice-cold bottles of water at the roadside for €1, so don’t worry too much if you guzzle your own bottle on the train getting there like I did! On your way back, be sure to validate your train ticket in the machine at the station, to avoid a big fine. Perhaps the most magical experience of our honeymoon was our visit to the exclusive island of Capri. We got the ferry (I’d advise buying a ticket in advance as the queues are very long) and then caught a bus up to the town of Anacapri. The bus is tiny so be prepared to queue for a while, and hold on tight if you don’t get a seat – the uphill, zig-zagging route is thrilling to say the least. Here we visited Villa San Michele, which boasts verdant gardens, sculptures and uninterrupted views across the Gulf of Naples. Anacapri is a quaint little town, permeated by the heady scent of the lemon groves that surround it. It has some fabulous shops, including a cobblers where you can have a pair of sandals handmade. Next was a tasty lunch in Capri’s Bar Gabbiano, down by the marina. It was here we met with our captain for the afternoon, Stefano. Having a private boat tour might seem a little extravagant, but hey, it was our honeymoon after all! 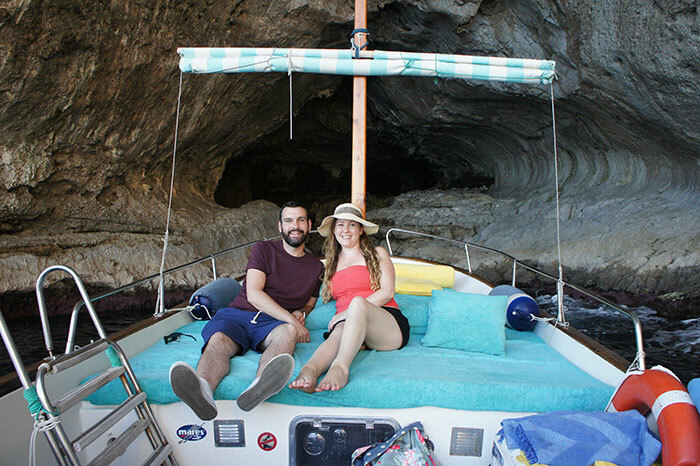 Seeing the coast from our own boat, weaving in and out of the grottos, sharing a kiss under the iconic Faraglioni arch (which is said to ensure a lifetime of love! ), feeling the sea spray on our faces and the wind in our hair was truly a memory that will stay with us forever. To top it all off I swam from the boat, which for a not particularly confident swimmer felt like a real achievement. Stefano pointed out all the sights, and was super helpful – he even rescued my hat from the sea when it got blown off! One of my favourite trips was the one along the Amalfi Coast. We started our journey on a bus from Sorrento station; the buses are every half hour or so, so be sure to get there as early as you can to avoid any crowds. An all-day ticket from the kiosk allows you to get on and off the buses as much as you like for just €8. For this particular trip, sit on the right-hand side of the bus; the winding roads are quite an experience. 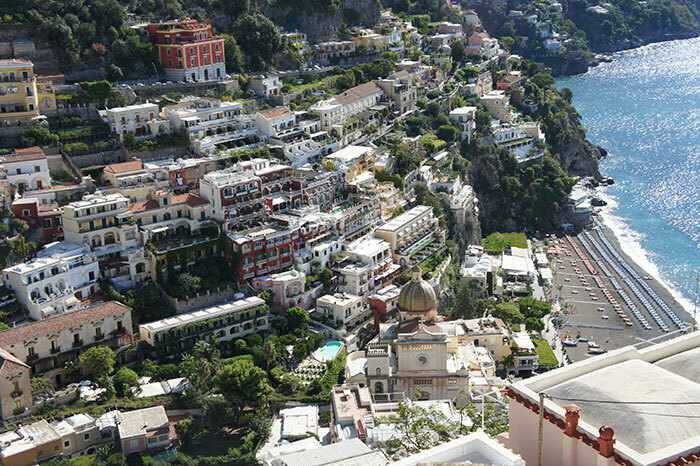 When we got to Positano I couldn’t stop taking photos, it really is that beautiful. The cliffs rise up from the vivid blue sea and the plethora of sun-bleached, pastel-coloured buildings is like something from a fairy tale. We began our morning here with a delicious breakfast at Caffé Positano; sat on the terrace by the cliff edge we could soak in the views even more. Just behind us were a set of steep steps which lead all the way down to the harbour. So, rather than get back on the bus, we took a ferry to Amalfi. You get a completely different perspective viewing the coastline from the boat – the sheer scale of the cliffs we passed, and the towns and villages that clung to them, was immense. Upon arrival in Amalfi, more treasures were revealed, in particular some quirky miniature statues; one set in a fountain in the main square and another under the balcony of a house in Via Cardinale Marino del Giudice. They really are enchanting. Most nights we went into Sorrento for dinner and were truly spoilt for choice. I’d recommend the Ristorante ‘O Parrucchiano La Favorita in Corsa Italia – it’s a really authentic and quirky place, founded in 1868, where you are engulfed in lush greenery and somehow feel as if you are on the set of The Godfather; the atmosphere really drew us in. Our favourite eatery was Café Latino a little further down the same road, we ate there twice which is always an endorsement! The ambience is very romantic, ideal for a honeymoon meal – all the tables are set in a charming walled garden, covered in fairy lights. On our second visit we sat under an aromatic lemon tree, which was just magical. They even give you a little recipe leaflet with your bill so you can attempt to recreate some of the meals back home. To say I am a major pasta fan is an understatement; I really enjoyed all of our meals, but it was on the last night that I could finally, without a doubt, say I’d had the best pasta I’d ever eaten. 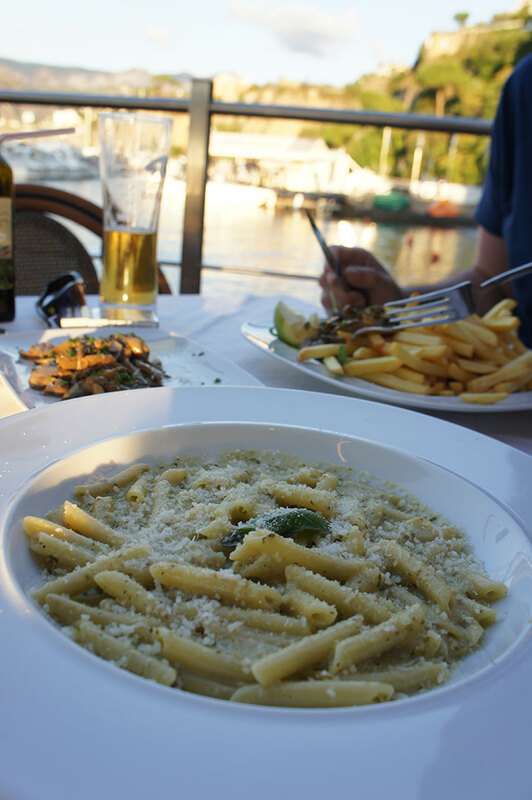 After a busy day sightseeing, we arrived back at the marina and dined at Ristorante Ruccio. I ordered penne pasta with pesto and it was absolutely exquisite. Dining together, listening to the water lap at the shore, and gazing out at a sensational view across the harbour as the sun set was the perfect end to our honeymoon. Get inspired for your honeymoon with our range of Italy holidays, or make your romantic break extra-special with a little help from our Travel Butler concierge service, which can recommend and book restaurants and attractions.